From the 2005 winner of the Governor-General's Award for Fiction and the former national film critic for CBC television comes a delightful and absorbing book about the agonies and joys of home-schooling a beloved son. 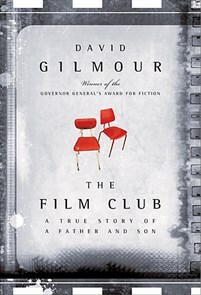 Written in the spare elegant style he is known for, "The Film Club" is the true story about David Gilmour's decision to let his 15-year-old son drop out of high school on the condition that the boy agrees to watch three films a week with him. The book examines how those pivotal years changed both their lives. From French New Wave, Kurosawa, and New German cinema, to De Palma, film noir, Cronenberg and Billy Wilder, among many others from world cinema, we read about key moments in each film, as the author teaches his son about life and the vagaries of growing up through the power of the movies. Replete with page-turning descriptions of scenes and actors and directors, the narrative is framed with the tender story of his son's first bittersweet first loves. This is a charming and poignant story about a very special time in a father and son's relationship. David Gilmour is a novelist who has earned critical praise from literary figures as diverse as William Burroughs and Northrop Frye, and from publications as different as the New York Times to People magazine. The author of six novels, he also hosted the award-winning Gilmour on the Arts. He lives in Toronto with his wife Tina Gladstone.